Dead-on and hilariously written. But I would say, before giving Fox too many accolades, that I suspect their coverage might be bent toward possibly suggesting that GWB’s vision for the Middle East with the Iraq and Afghanistan wars is finally coming to fruition, a ridiculous and unsupported assertion at best. I always question their motives. This all becomes an issue when the responsibility lies not in informing viewers, but in entertaining them, increasing that audience, and satisfying advertisers. 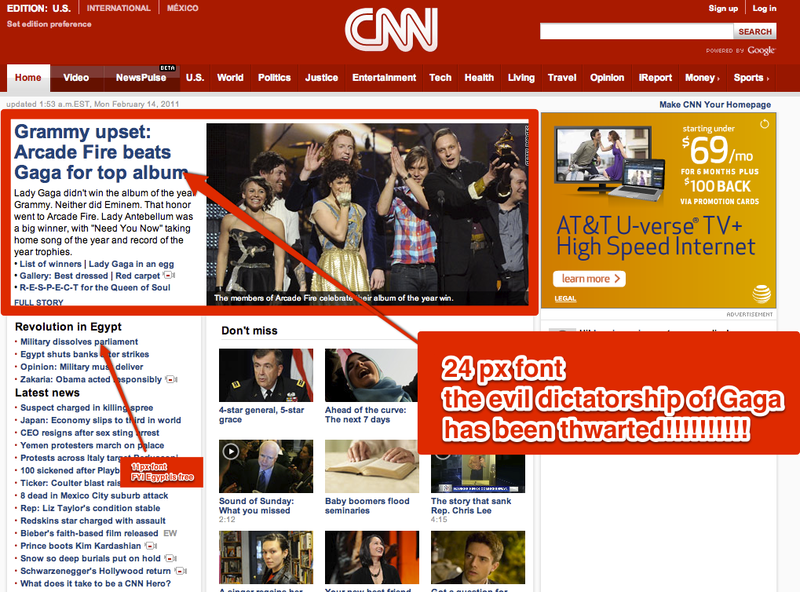 You missed earlier in the Egypt event…when CNN decided that Charlie Sheen was the top news story. 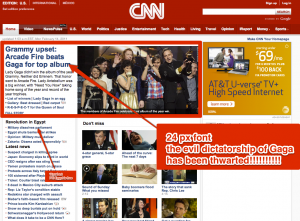 Welcome to the post-TMZ newsworld. Glad you’re posting again. I want more rants. normally i try to avoid talking politics with people from work, I tend to get myself into trouble. But I’m gonna make an exception here to say you’re ABSAFUCKINGLUTELY RIGHT. I can think of half a dozen homeless schizophrenic people that I’ve walked past in the last week (oh the joys of working in SF) whose mumblings are more relevant to what’s going on in the world then the drivel that passes for “news” on america’s major networks. This makes me sad.